How Much Does the 2017 Jeep Grand Cherokee Cost? How Many MPG Does the 2017 Jeep Grand Cherokee Get? What’s New for the 2017 Jeep Grand Cherokee? The 2017 Jeep Grand Cherokee is a unique SUV. It’s got a host of incredible traits, including true off-road capabilities, upscale amenities, versatility, style, and four impressive engine options. It’s a rare combination of features. You’ll be well-suited to tackle any trail in the Grand Cherokee, which is built for this kind of adventure. A lush interior with plentiful technology, safety, and comfort features will ensure every passenger feels at home within its walls. Each engine option will provide you with a different perk, including great fuel economy, robust towing, or a perfect balance between power and efficiency. For someone interested in features and performance, you can opt for the Grand Cherokee SRT which will be reviewed in its entirety separately. For this model year, the Summit has some fresh styling and luxury interior garnishes. Additionally, this year a self-parking system and lane departure warning are made available, and a rearview camera and rear parking sensors come standard on every 2017 Grand Cherokee. Take your choice of powertrain and capabilities in the 2017 Jeep Grand Cherokee. You can opt for the standard 3.6-liter Pentastar V6, which will give you 295 horsepower and 260 pound-feet of torque. This engine has a fuel economy of up to 26 miles per gallon. As a perfect cross between power and economy, this V6 is a great option in the engine lineup. Alternatively, you can select a 5.7-liter HEMI V8 that will give you ample power and a best-in-class towing capacity of 7,400 pounds. It sends out 360 horsepower and 390 pound-feet of torque. The third option is a 3.0-liter EcoDiesel V6 that outputs 240 horsepower and 420 pound-feet of torque. This engine has an impressive fuel economy of up to 30 miles per gallon. The Grand Cherokee SRT has a unique 6.4-liter V8 engine that provides it with 475 horsepower, 470 pound-feet of torque, and astonishing performance capabilities. The Grand Cherokee comes in a two-row, five-passenger configuration. There are six trim levels: Laredo, Limited, Trailhawk, Overland, Summit, and SRT. The SRT will be covered separately. The Laredo will provide you with plentiful features including keyless ignition and entry, a 5-inch Uconnect touchscreen, a leather-coated, tilt-and-telescoping steering wheel, heated mirrors, 17-inch alloy wheels, foglights, a rearview camera, automatic headlights, Bluetooth, a six-speaker sound system, and automatic dual-zone climate control. For comfort, the Limited is a great choice. If you want better off-road capabilities, opt for the Trailhawk. The Overland and Summit offer ample luxury features, while the Summit also contributes advanced safety technologies. In crash testing conducted by the Insurance Institute for Highway Safety, the 2017 Jeep Grand Cherokee received top marks in side impact, moderate-overlap front impact, roof strength, and whiplash protection tests. For superb safety, the Summit provides all the latest safety technologies including a self-parking system, a forward collision mitigation system with emergency braking, adaptive cruise control, and more. For a Jeep that appeals to a wide range of needs and satisfies all of them equally, the 2017 Grand Cherokee is a fantastic option. 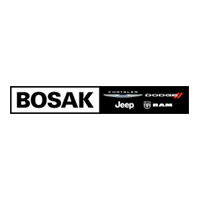 Come to Bosak Motors today to see how the Grand Cherokee could be the best option for you! * MSRP excludes destination, taxes, title and registration fees. Starting at price refers to the base model, optional equipment not included. A more expensive model may be shown. Pricing and offers may change at any time without notification. To get full pricing details, see your dealer.